Qin Leng was born in Shanghai and later moved to France, then to Montreal in Canada. She now lives in Toronto with her husband and works as a designer and illustrator. She grew up surrounded by paintings, and her father, an artist himself, was a great influence on her. Qin graduated from the Mel Hoppenheim School of Cinema and has received many awards for her animated short films. Her picture books have been nominated for such prizes as the prestigious Governor General’s Literary Award, and she won the APAAL for Best Picture Book. You can visit her at www.qinleng.tumblr.com. A lively take on a woman who, despite publishing conventions that favored male writers, refused to let her authorial voice remain mute. 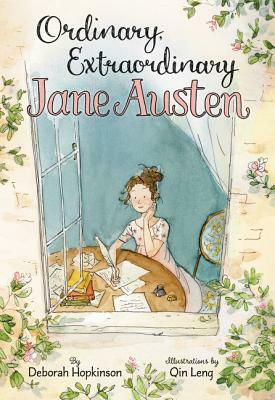 This manages to successfully introduce Austen’s characteristic wit and social commentary to an audience who would otherwise be too young to digest the original works. A delightful read.